The new owners of this property in Mansfield were keen to upgrade the original timber sash windows with energy efficient double glazed sash windows, whilst still maintaining the Victorian splendour of their property. Bygone Collection Wood Effect Timber Alternate UPVc Sliding Sash windows were selected as they are ’A’ rated for energy efficiency and are the most authentic looking upvc sash window available on the market. The full timber jointing, deep bottom rail, run through horns and slim krypton double glazed units, made the transformation from old single glazed sash windows to new double glazed, no maintenance sash windows seamless. 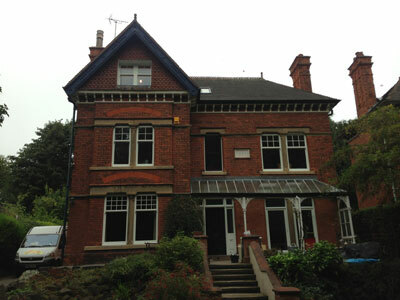 Internally the windows were fitted with internal woodwork architrave and timber stub cills. 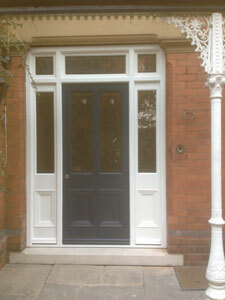 To complete the project a bespoke hardwood front door and frame was installed. A special commission of traditional stained glass was also undertaken.